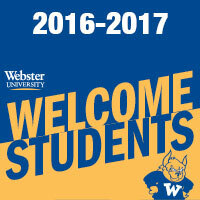 Sign up to help welcome students to Webster in January. Welcoming new and returning undergraduate and graduate students is crucial and impactful for Webster University, and the Welcome Student Committee needs your help during the weeks of Jan. 9-19. There are a variety of ways in which faculty and staff can assist with these important efforts, such as taking a shift staffing the Welcome tables, or mingling and greeting new students at meal times. This is also a great chance to interact with colleagues you might not otherwise meet, and to interact with the wonderful Gorloks who make up our student body. If you can offer your time and energy, please click here to volunteer. Thank you for your generosity and passion for Webster University. We hope to see you as we welcome our new students to campus! Questions regarding Welcome Tables for new Graduate Students should be directed to Graduate Admissions counselor John Weseman, johnweseman00@webster.edu.